Fifty years ago, when I was a teenager (it doesn't hurt if I say it quickly! ), I was a Boy Scout. I belonged to a suburban scout troop in the south-western suburbs of Brisbane, and there I learned about knots (the only knot I can remember now is a reef knot!) and camping (my last attempt at camping was driving a camper-van around Europe in the 80s, and that brings back a series of horror stories!). Anyway, my local scout troop was part of the John Oxley Scout District that was made up of about a half-dozen suburban troops. 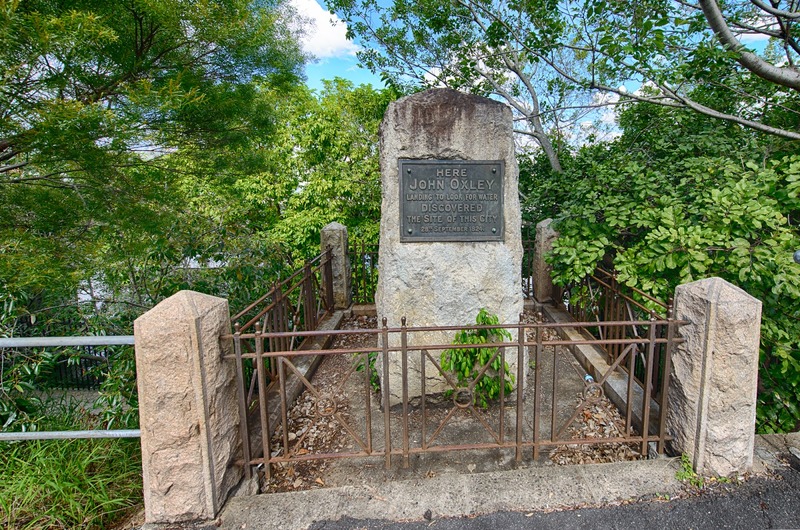 The District Scoutmaster determined that we should learn a bit about the intrepid explorer for whom the District had been named and one weekend we were all duly transported to the monument that marked John Oxley's initial landing in Brisbane. 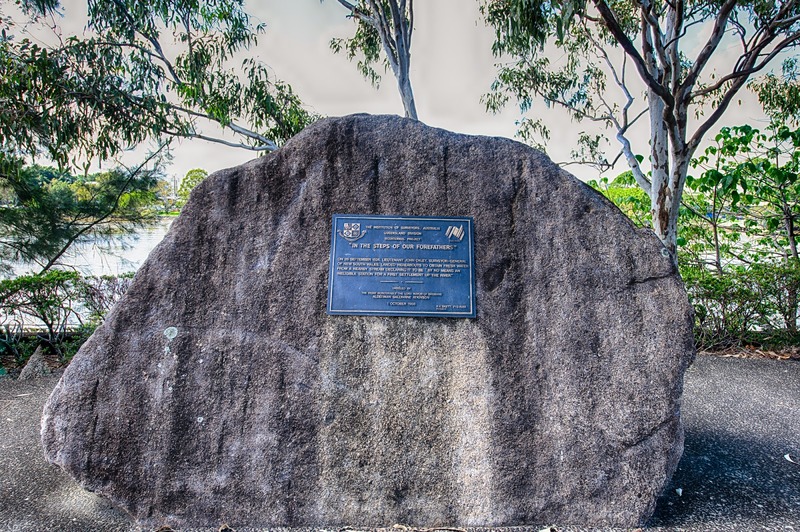 That monument stands next to the Brisbane River at North Quay, right where the western arterial road, Coronation Drive, strikes the CBD. Thousands drive past it daily and most would not know that it existed, let alone care. This photograph is undated and was taken by Capt Frank Hurley. I don't really recall much about the Boy Scout excursion to the monument. I understood about Oxley sailing up the river and marking a spot suitable for a settlement, but I mistakenly thought that he must have been a Boy Scout and that had somehow assisted him in his travels. Be Prepared and all that. 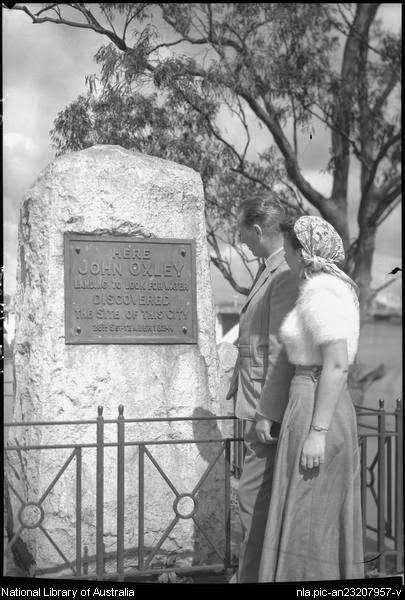 So I have always been aware of the existence of this monument, even though most of Brisbane (apart from the Boy Scouts in the John Oxley District) seemingly wasn't. The monument was erected in 1928 as a result of research done by the founding president of the Queensland Historical Society, Professor FWS Cumbrae-Stewart. This is a current picture of the monument. Improvements to Brisbane's chronic traffic problems have pretty much isolated it from public view. Imagine my surprise when I found out that this monument is probably not accurate and that another monument marking the same event exists in another spot nearly two kilometres away. It's a tad embarrassing when you think about it. A city that doesn't really know about its very beginnings and is prepared to fudge fund two attempts at history. Here I confess to my own ignorance of the second monument, although I have passed it by car, by bicycle and on foot thousands of times. It is upriver from the first, jammed between Coronation Drive and the Brisbane River, and it looks like this. This one has the imprimatur of the Australian Institution of Surveyors (Queensland Division) and was erected for the 1988 bi-centenary, but it owes its existence to research done by historian TC Truman. After a thorough perusal of Oxley's field book, Truman concluded that Oxley's actual landing-spot was further upstream than was thought earlier. Truman referenced a "chain of ponds" that he took to be Western Creek, which used to meander through Auchenflower and Milton to the Brisbane River but is now largely extinct save for some underground drains. The newer site passes the pub test too - the original monument stands at the crest of a 10 metre incline from the river, hardly a practical place to disembark. The latter venue would have been a far more accessible area for Oxley to scramble ashore. Truman's theories were published in a series of articles in The Courier-Mail in 1950. I suppose it doesn't really matter all that much. As I have noted previously there are reminders of Oxley scattered far and wide in this neck of the woods - everything from roads to libraries and hospitals - and rightly so, too. But who would even know that there were two monuments in two separate spots, each proclaiming the same thing? I can tell you who - it is author Matthew Condon who cleared the whole matter up in his book Brisbane, available at your local library. Click here for a Google Map to Monument 1. Click here for a Google Map to Monument 2. I remember learning about John Oxley in primary school but have forgotten most of it now. How interesting that there were two monuments professing the same event. An embarrassment indeed. I am going to enjoy reading your blog especially being that I have an interest in sketching places in and around Brisbane. Yes, I have seen Angus's site and I agree that it is excellent. Oxley was always my fave local explorer, mainly because I was in Oxley house (house colour a sort of piddle yellow) in primary school (Bardon State School).